Only the strongest dragon survives. 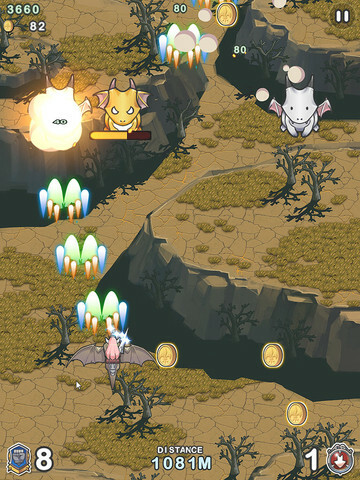 NextFloor's Android and recent iOS release, Dragon Flight, seems easy at first. Slide a finger left and right to steer the 2D dragon, and shoot enemies falling from the top of the screen, at least until you realize you don't pack enough firepower to destroy the yellow and pink dragons. Then the action speeds up, and before you know it, your adorable lizard's a burning wreck. That is, unless you follow this Dragon Flight cheats and tips guide. Before doing anything, sign up for NextFloor's Kakao network, as doing this grants access to friends playing Dragon Flight and the game's item shop. Enter an email address and password, then wait to receive a confirmation code (should arrive within seconds). From there, you'll have access to everything this addictive shoot-em-up has to offer. These dragons are the easiest to destroy, and killing them opens up a path to safely travel through. If you see exclamation points suddenly appear, that means an asteroid is about to fly down the screen. Avoid it at all costs. Tip: In the case of multiple exclamation points, pay close attention to the order in which they appear, and move accordingly. Unless you're strong enough, avoid taking on tougher enemies at the last possible moment. More often than not, you'll be unable to kill them in time and die as a result. Just go for the weaker white dragons to create some space, and move on to the next row of baddies. Gold coins are cool, but don't let gems disappear, as you'll miss out on some valuable loot. Sure beats picking up one gold coin at a time. We strongly dislike bribery, but if you want to earn 3,000 gold coins for free, review Dragon Flight on the App Store. Keep in mind that you'll score this virtual cash regardless of how low or high you rate the game. You simply won't get very far unless you spend coins to upgrade your weapon. Doing this makes it much easier to destroy those annoying yellow, pink and red dragons. Basically, the more firepower you possess, the longer you survive. After you give the primary weapon a boost, check out the following power-ups. Powershot: Powerful light can be used to eliminate monsters ahead. Excessive use is forbidden. You can only carry nine shots max. HF 1500M: In a blink of an eye it will take you 1,500 meters forward. HF 3000M: Get this potion if you want your flight starts quicker. A 3,000-meter head start. Slow: This potion will make Fury dragon move slower by making it calm. Unfortunately, it can only be used one time per flight. Final Flight: Get this item if you want to renew your best record. Helps to get over monsters. Holy Artifact: Bless your next flight with holy power of the St. Forte. Dragon Egg: Hatch a dragon egg. Baby dragons will be able to take part in a battle and its attributes will be decided at birth. Nutritious Meat X10: Highly nutritious meat which promotes the growth of baby dragons. Includes 10 pieces in package, consumed automatically when purchased. You can't play Dragon Flight without wings. What are these? In simplest terms, each one represents a chance to play the game. Run out, and you'll need to wait until game generates more automatically, or you can purchase some. Tip: Invite people to join your friends' list to earn free wings. Dragon Flight's default character, the Knight, is fairly useless. Her friends, on the other hand, will give you an edge during play. You'll just need crystals to buy them all. Witch (60 Crystals): Gain double gold. Assassin (40 Crystals): Revive with the power of darkness. Princess (40 Crystals): Pull any item during flight. It takes a long time to amass enough coins to buy everything. No patience to wait? Put that gift card or credit card to good use. Tip: You'll receive a free Crystal each day you play Dragon Flight.